DIY air-conditioning service and maintenance only go so far in keeping your home comfortable for less money. Check Marble Falls, Burnet, Llano, and other Highland Lakes AC service professionals for help in getting the most out of your heating and cooling systems. When it comes to home improvement, the obvious fixes are sometimes the most important, especially when it comes to your home heating and cooling systems. If you have been neglecting your air-conditioning service then you owe it to your quality of life to get back to basics. Here are some of the characteristics of a successful air-conditioning maintenance program with tips on how to get the best air-conditioning service and repair in the Highland Lakes. Some air-conditioning service and maintenance you can do yourself. Going DIY saves money in the short term. It also preps your system for the professional assistance that saves you money in the long run. Your air-conditioning repair person will have a much easier time going deep into your system if the basics have been taken care of all along. Changing filters is the most important — and easiest — service you can do on your own. Clean filters can save you 5-15 percent in energy consumption. A clean filter also ensures your home maintains high indoor air-quality levels. You can also change your coil fins and condensate drains. Even if you do not do this yourself, however, you should clean around the condenser coil every so often. Otherwise, leaves and debris might find their way into your system. • and sealing any duct leakage. All checkpoints, repairs, and maintenance above are important to the health and longevity of your air-conditioning system. You should schedule a routine professional inspection. Depending on how often and how intensely you use your AC, this routine service could be every three months or just once a year. 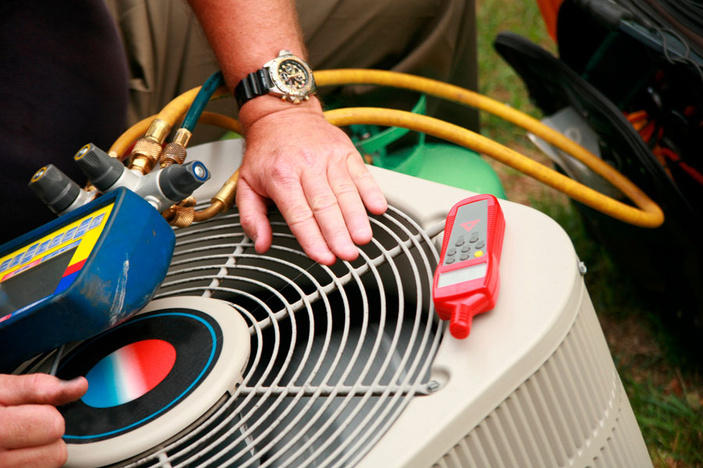 Air-conditioning repair and service specialists in the Highland Lakes are ready to help you with the AC maintenance tasks that require professional assistance. Keep a consistent schedule of AC maintenance so you never have to worry about unexpected emergencies. Consistency is also the secret to energy-efficient air conditioning. You can only save money if all of your working parts are functioning at a high level of efficiency. The best in Marble Falls, Burnet, Llano, and other Highland Lakes AC maintenance, service, and repair specialists can be found in the Highland Lakes Home Improvement and Construction Guide or The Picayune Area-wide Phone Book.